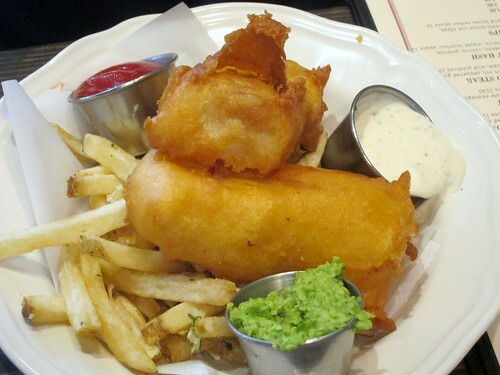 When a gastropub opened up in Old Town Pasadena, I admit I didn't pay much attention. That is, until I saw Deep End Dining and Trippy Food rave about the oxtail at Kings Row. They claimed it was fit for a king, and that intrigued me, so when they invited me to try out the new brunch menu, I accepted. Kings Row opened in the old Neomeze space, which they have completely transformed from the pink and blue-lit lounge to the brick-walled bare space playing country music. The brunch menu was pretty diverse with dishes ranging from chorizo fajitas to chicken fried steak to fish and chips. And buckwheat waffles a.k.a. the best waffles I've ever had. More on that later. A hint for things to come: the portions are generous. The chicken fried steak ($13) was a bit inconsistent. I liked my half, but the other half was for some reason over-salted, but they just started and it's a fixable problem. 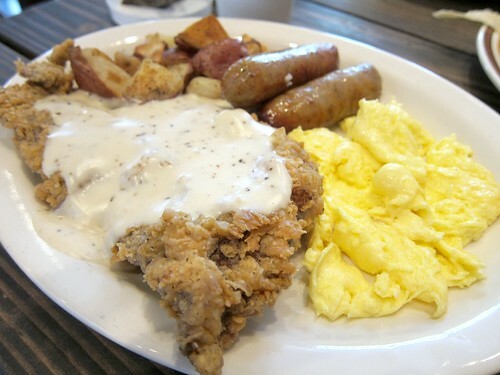 Chicken fried steak served with potatoes, AND eggs and sausages? This probably could have fed two. I had a bite of Pleasure Palate's duck confit hash. This will be a plus for some and minus for others: the hash was cooked in duck fat, so it was quite greasy. 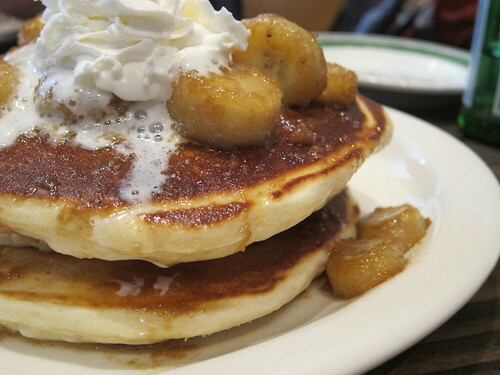 The menu at the time featured a selection of griddle cakes, and we tried the Bananas Foster one (pictured at top). It sounded better than it ended up being, it was rather boring after you finish up the bruleed bananas on top. Luckily for us, before Trippy Food left he told me the buckwheat waffles were excellent. It was available as chicken and waffles in that menu, but I asked if I could just have the waffle by itself. They served it simply with fresh berries, butter, and maple syrup, and it might just be the best waffle I've ever had. 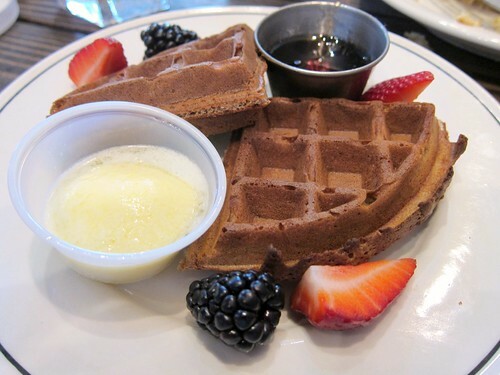 Perhaps it was the buckwheat, but the texture was quite different than a regular waffle. The outside was crispier than usual while the inside remains moist. Waffles tend to be too sweet for me, but this one has a nice, light bitter notes to balance it out. We told the chef, Thomas Jesse, that he should put the waffle on the menu instead of the griddle cakes! He said he'll need to buy more waffle makers but I really hope it will happen soon. Oh, did I mention these buckwheat waffles are gluten free? I never knew buckwheat was gluten free but I checked in Wikipedia and it is! It's not actually a wheat and is neither cereal nor grass. A lot of the commercially available "buckwheat flour" is actually a mixture of buckwheat and wheat, though, so be careful. Being a gastropub, you can also get your drink on early during brunch with mimosas, bloody marys, sangrias, cocktails, etc. They also have a gluten free beer (who knew that existed?). While there were a couple of kinks at Kings Row (sorry can't help it), it was only the first couple of days of brunch. The food was good - flavorful and satisfying. 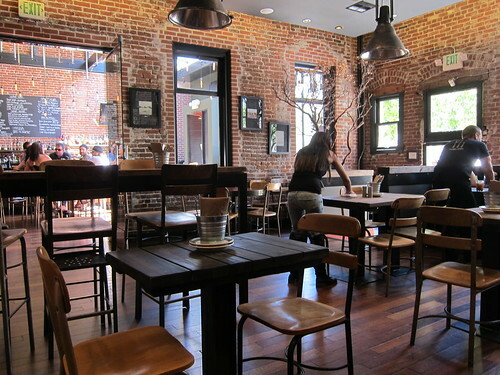 A definite step up for Old Town Pasadena, though the food tends to be heavy. Think hearty American breakfast instead of dainty brunch (to be fair, they also have yogurt and granola). I may not want a heavy brunch every weekend, but you'll see me eating buckwheat waffles here anyway! Damn. Now I'm craving a buckwheat waffle.